Sorry for no post last night. After 48 hours on the road, I was just disoriented/tired. We're still tired, but all is well and everyone is enjoying the trip. We have a great guide and driver. Weather is good; just a little warmer then we have been used to lately in Ellensburg. I bring you up to where we are at as we end day two, with a few pictures. Thought maybe less than I planned, because the internet connection here is really slow! My pictures are even getting out of order. Here we are with our guide Mike at the port of Joppa. Bleary eyed, we arrive in Israel after a 11+ hour flight. This is the hippodrome, the sports arena for chariot races and more. Herod build a grand palace here out into the ocean. It was in this area that Paul was held by Felix for about two years before he was sent to Rome. The moat and walls that protected the city during the Crusader era. The aquaduct that brought water to Ceasarea from ten miles away. Our group getting toes wet in the Mediterranean. A statue of the prophet Elijah on Mt. Carmel, near the site he had a "God-off" with the priests of Ba'al. Looking out to the east from Mt. Carmel. 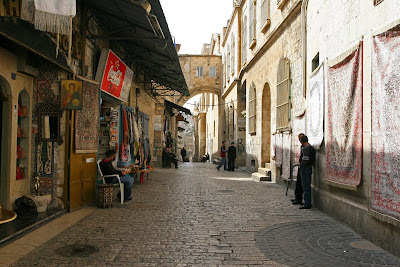 Some shots of the souk (marketplace) in the old city of Acco. Some of the older parts of the city built by the Crusaders 1000 years ago. Richard the Lion Hearted and St Francis would pass through here. Tomorrow we head to Megiddo and Nazareth. Thanks for looking. Israel 2008 - Stand By! 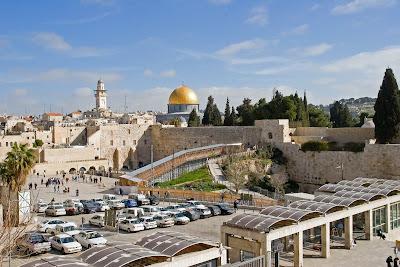 In just a few days, our group will be heading to Israel. We leave very early on Wednesday, October 29 from SeaTac, get to spend six hours at JKF, then take a late night flight to Tel Aviv. We'll have eleven days to tour this amazing place. When the group leaves, I'll spend four more days doing some photography and visiting a few more sites. 2. Some time at the end of each day to put the post together before I collapse. It will probably be a few days into the trip before I have the first post up. Stay tuned!